According to this thread I can disable this thing altogether but this battery-critical-power-down not always happens. Is there a way or terminal command that can stop the power manager shutting down my computer when that infamous message box pops up? Insert nothing here and it should just crash with undetermined results if it actually ends up with an empty battery. Run gconf-editor from command line and go to apps > gnome-power-management > actions. As far as i know, the computer can be set to either Shutdown, or Hibernate (free space/swap space providing). If Hibernation is something you consider an alternative, then you should be able to change it in the Power Manager. If not, then the system is trying to protect it's hard disks/memory from corruption, and it would be very difficult to disable, and is something i can't help with. Not the answer you're looking for? 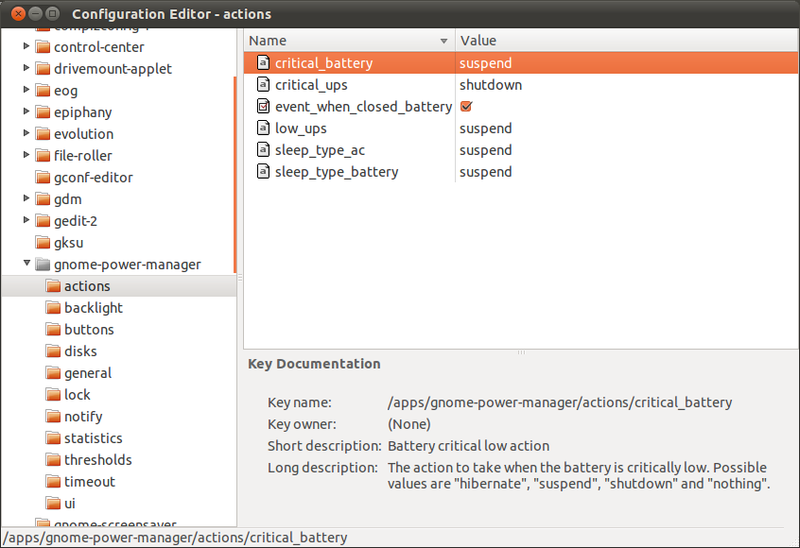 Browse other questions tagged shutdown battery gnome-power-manager or ask your own question. How to cancel a shutdown process invoked through a low battery state? How to stop gnome-power-manager from changing the global backlight setting? How can I disable automatic screen dimming when the wireless mouse has low battery?